I stayed a week at this hostel and I can honestly say that I could have stayed two weeks more. Best Hostel in Seoul so far. The staff is very friendly and will always take care of you the best way they can. They will always be down for a drink or two before clubbing with you too. There is a lively atmosphere that makes you feel like home very quickly. The little breakfast is nice and the curtains on the bed give you the privacy you need in a hostel. I would definitely recommend! The hostel has a really good karma. I had a great time with cool guests and the best staff. 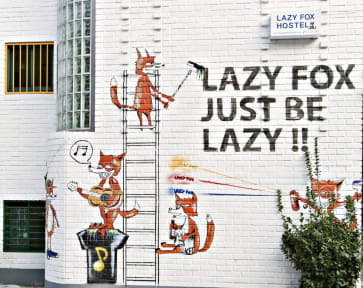 When I go back to Seoul, I will definitely choose Lazy Fox. Thanks to Sunny and the team! I really enjoyed my stay in Seoul at this Hostel The staff gave me great advise where to go to and what to see - thanks again! The location is pretty good aswell, close to the metro line 2 and in walking distance to the Hongdae center. Would definitely recommend staying here! I didn’t really like this hostel. It was not clean, the staff was watching series in the common room on such a high volume all day long, there was mold in the bathroom, we couldn’t check in when we arrived (it was hours after check in time), the hostel is constantly overbooked, I couldn’t sleep at night, because people were so loud (including the staff). A guy who changed the room forgot to give his key back, but the staff didn’t really care. So he could have come into our room at any time. No professional cleaners, which you can really tell. The locks on some of the bathroom doors don't work and the music is so loud all day long, that you can't even hear if somebody knocks on the door. The staff is just working there to make party every night, so you wake up in the middle of the night, because of them and other drunk guests. Would only recommend this hostel, if you're looking for a party hostel.